Handle trophy fish so they'll swim another day. Nice picture of a fish under X-ray. Re: Handle trophy fish so they'll swim another day. Try to avoid suspending the fish vertically by their jaw or gills, research conducted at Fisheries shows that it places excessive stress on the 1, 2 and 3 vertebrae closest to the skull (as indicated in this X-ray). During the last set of big tides there were plenty of reports of big fish being caught at most of the well-known spots across the Top End. Hopefully this great fishing can continue over the big tides on the Easter long weekend. Catching big barramundi and threadfin is a real rush and certainly gets the adrenalin going, but please remember during all the excitement that these big fish are the breeding females and if possible should be released unharmed. To release them successfully they need to be treated correctly to avoid any stress or damage that may reduce their chances of survival. When removed from the water these big fish should be held horizontally with both hands to provide maximum support and reduce the likelihood of injury. 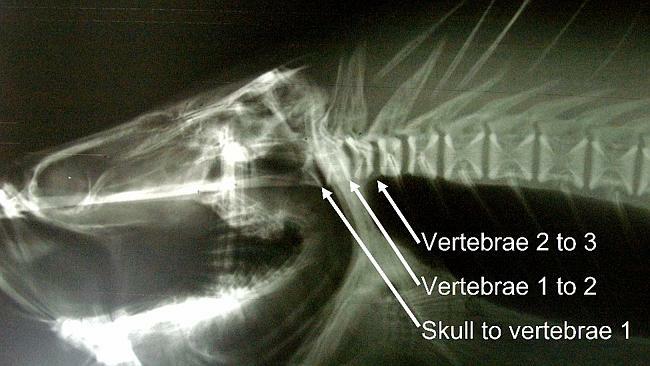 Try to avoid suspending the fish vertically by their jaw or gills, research conducted at Fisheries shows it places excessive stress on the 1, 2 and 3 vertebrae closest to the skull (as indicated in the X-ray). Incorrect handling can lead to injuries such as separation of the vertebrae, tearing of the jaw membrane and even broken jaws which may not necessarily be visible. It’s great to take photos of these trophy fish – and to make sure other people get this same opportunity, handle these fish correctly. This message needs to get through to Aussie "tournament anglers" who seem to feel a need to follow the Seppo styles. Stickered up boats / shirts & flat caps may look rediculous but only hurt themselves, this habit of lifting fish by their jaws however needs to stop. Ed.